experience self-doubt and wonder if, hey, they're missing something about Solas. 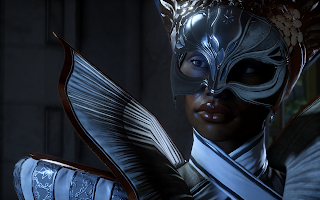 VIVIENNE: "I don't know what to make of Solas. So much knowledge and so little personal history... I find that... peculiar, don't you?" NOTE: This post is part of a continuing series ("Meaningful Banters"), in which I shine a spotlight on especially important or revealing moments that occur between companions in banter, during the course of the games. 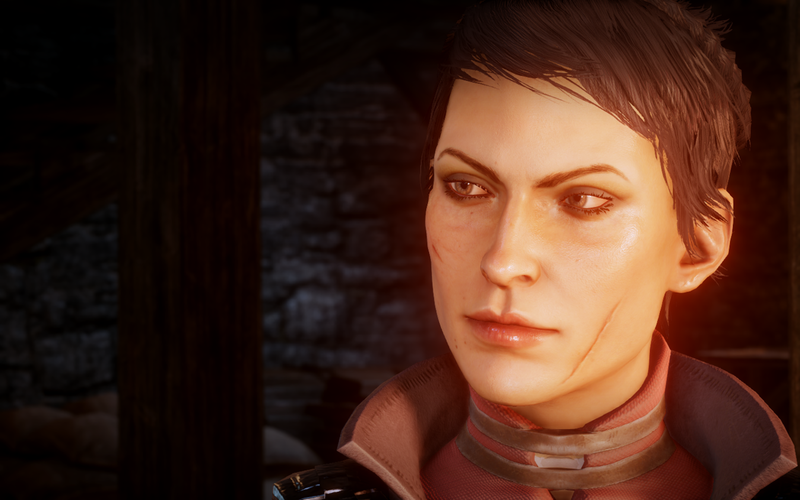 SPOILERS GALORE for Dragon Age: Inquisition! 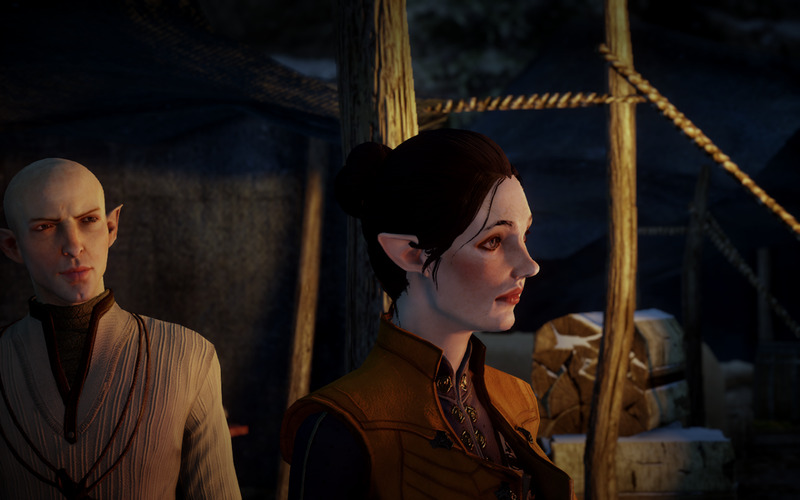 Our companions in Dragon Age: Inquisition are a smart bunch, and let's remember that they spend over 18 months together fighting evil, bantering, befriending, quarreling, flirting, teasing, and falling in (and out of) love, so it's interesting to go through their banter comments and dialogues and to realize that, seriously, many of them show at least a momentary suspicion of Solas. There are a surprising number of little moments where we find an instant of indecision, of wavering on that narrow balance, when you can see them, visibly, however briefly, wonder if maybe they're missing something about the quiet mage in their company all those months. Bull knows something's up with Solas. First moment to last. Iron Bull: I've seen self-taught warriors. Even the good ones have something awkward in their style, something that clunks. I don't get that from you. Maybe magic is different. Solas: Or without magical training, you cannot notice the parts of my magic that "clunk". Iron Bull: Not the quiet elven mage, though. No frills. Nothing to give you away. Half our targets never even see you coming. Solas: I shall take that as a compliment. 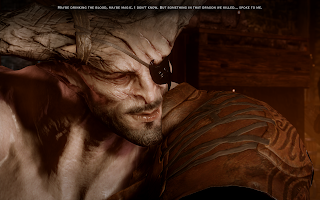 Iron Bull: If you like. I'll always adore the interactions between Solas and Bull, not least because I think both men are incredibly similar beneath the skin. They're both able to compartmentalize, they're both hot and cold, they're both hiding significant aspects of who they are and what they want, and they're both absolutely able to make the hard (brutal) choices when necessary. Viv never catches on about Bull, but she surely suspects Solas. "I don't know what to make of Solas. So much knowledge and so little personal history... I find that... peculiar, don't you?" I love this. Viv's so sharp, and while she's sometimes incredibly narrow-minded, not much gets past her. As here. "Solas? Pfft. His head's crammed up a thousand years ago." This one's so on-point it's positively scary. BECAUSE IT'S TRUE. it: "So... Solas... where were you when the Conclave blew?" Cassandra: Hmm. Lucky for us, then. This is terrific, because it spotlights how clever and insightful our Seeker is, and she's not always credited for her perceptiveness. But here, she's definitely showing that maybe his cover story wasn't quite as smooth as he might have thought. 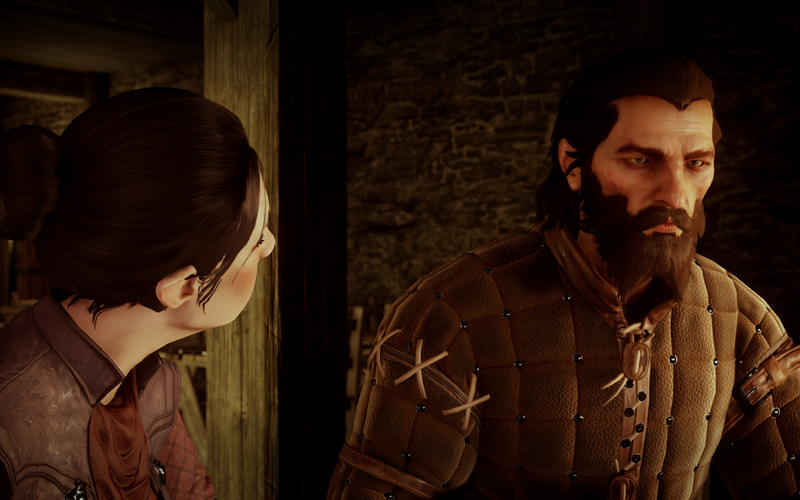 handsome Tevinter companion actually is. Dorian: That orb Corypheus carries... are you certain it's of elven origin, Solas? Solas: I believe so. Why do you ask? 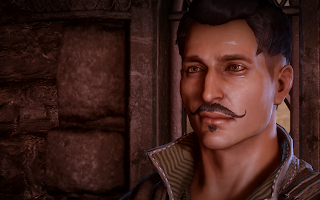 Dorian: There are paintings in the Magisterium's archives of men holding similar orbs. They were depictions of a time long before the magisters. The ancient Dreamers, perhaps. The texts called those orbs "somnaborium"--"vessels of dreams." Could they be the same thing? Solas: Perhaps. The humans of ancient times took much from the elves. Dorian: And Corypheus isn't far removed from the time. Hmm. I love this dialogue exchange, and how much it's a reminder that Dorian is at heart a beautiful scholar and fellow geek. He may have much to learn, but he's also a thinker who's incredibly smart. He forgets nothing. And the final "Hmm" from Dorian here is perfection. I think it's obvious his mind is racing and he's already considering the possibilities. Cole knows all, but he also trips up on his own knowledge a few times, and it's fascinating, as noted here below. private details, in spite of himself. Cole: You are quiet, Solas. Solas: Unless I have something to say, yes. Cole: No, inside. I don't hear your hurt as much. Your song is softer, subtler, not silent but still. Solas: How small the pain of one man seems when weighed against the endless depths of memory, of feeling, of existence. That ocean carries everyone. And those of us who learn to see its currents move through life with their fewer ripples. Cole: There is pain though, still within you. Solas: And I never said that there was not. Of course, as writer Patrick Weekes has noted, Cole always knew the truth about Solas and didn't judge him, reveal his origins, or even find them suspicious or worth mentioning. But I love that these banters take place in front of their companions, and what they inadvertently reveal. "Ignore this! Look Over There!" to entertain any of his own. What's interesting here is our ability to note those companions who question Solas's backstory, and those who simply do not. I certainly think Varric might have caught on with more than he lets on, but I think Solas has sparked his empathy and successfully distracted him with that. 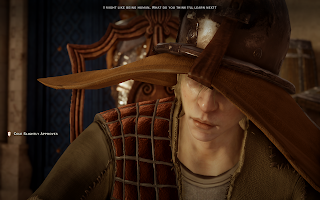 Varric's too busy thinking about Solas's sadness and loss of hope that he's not asking questions about how they met. And Blackwall is, of course, too busy keeping his own secrets and addressing his own guilt to ask the questions he might normally ask. I love these little glimpses of how Solas's story, smart as it is on the surface, has these little cracks in it. He had to act quickly, so I like that his cover story isn't 100% -- and that our companions are smart and special enough to, just occasionally, say, "Hmmmm..."
What other instances have you seen where Solas gives himself away? Have I missed any? Perhaps it's been discussed elsewhere, but I'm confused at the remark Solas makes regarding veilfire the first time we find it, "I have heard of this but never seen it before. It is called veilfire." Okay, so if he's claiming to have never seen it, how does he know how to create it when he does his oh-so-suave saunter over to the handily placed brazier when he pulls the Herald aside after Haven/before Skyhold? I'm sure the explanation, like the one he gives for his knowledge of the orb being elven in origin, goes something like, "Because The Fade." That's such a great question. I do wonder if the two substances are the same, though -- veilfire has that greenish undertone to it, while the magical fire Solas conjures in his saunter up to the torch is very blue. So I guess I could argue that perhaps they're two different flame types? I'm gonna pursue this further though, because it's a great question. 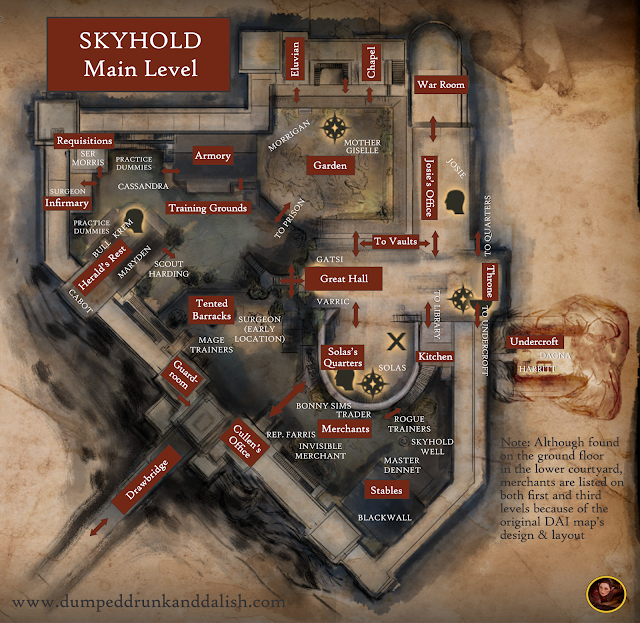 would say the Blackwall banter with Solas about Val Royeax when it was a collection of dirty humans and tents. I can't remember the exact wording. The Solas/Sera banter where he asks her about seeing the Fade and not being as different as she thinks. His thinly veiled debate with Varric about the morality of his own course of action. I can't think of any more off the top of my head. I think it's time to listen to the banter again on Youtube. Stacey, thank you so much for reading and commenting! Those are great points. My only rebuttal would be that none of the three you mention actually suspects Solas there, even though you're right about the clues he's giving. However, I am going to include those and several others in a separate post to come in the future, that will address all the times Solas gives HIMSELF away! They'll also include his dialogue about life before the Veil, the dialogue after Halamshiral, and several other moments. I love how often he stumbles (in these very subtle ways).